CORRCL must be tuned down substantially with high lift and overlap cams, due to corrupted o2 readings in that range. Because the o2 readings become unstable, corrcl will begin to ‘fight against the system’, making inaccurate fueling calculations that cause a chain reaction with the integrator, then the BLM cells. CORRCL appears to be a primary cause of the ‘BLM Splits’ reported with larger cams due to inaccuracies in o2 readings being too quickly propogated into fueling changes, but more testing is needed. Reduce CORRCL correction strength to match the lumpyness of your cam, or you can try nearly disabling to see if the integrator is better off on its own. Generally the more control you give to the slower-reacting integrator with a big lumpy cam, the better. 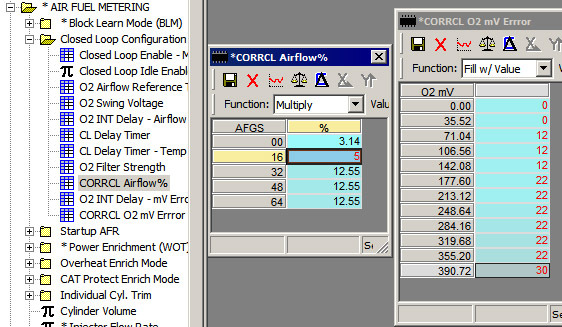 The settings below cause corrcl to make smaller corrections, especially at low airflows where the o2 corruption is at its worst. Running open loop full time is an option for race only or extreme street cars where economy and emissions are of no concern, and corrupted o2 readings simply can’t be corrected to a satisfactory level on some engines. That’s ok! You tried. Built smallblocks just LOVE to run rich, and you have obviously thrown out the desire for fuel economy by building such an engine anyway. EE will run quite happily in open loop, and give you whatever AFR targets you want. Tuning all of the fueling tables as close as possible with a wideband is highly reccommended, and simply raise the closed loop enable temperature as high as possible. This is also a good idea to do temporarily, when wideband tuning a car intended for regular closed loop operation.